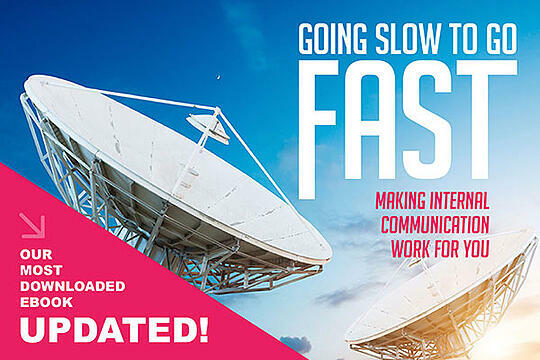 This eBook remains a go-to resource for communicators who want to build a strategic, streamlined, and effective internal communication plan that speaks directly to the number-one question on business leaders’ minds: How will this improve our bottom line? It addresses why communication is essential, how to break through and avoid communication clutter and covers the key steps to developing a communication plan. Good internal communication gets the message out, but great internal communication helps employees connect the dots between overarching business strategy and their role. When it’s good, it informs; when it’s great, it engages employees and moves them to action. Quite simply, it helps people and organizations be even better. Download—Going Slow to Go Fast: Making Internal Communication Work for You—by filling out the form to the right. See why good employee communication can improve an organizations success by turning strategy into action.